Cu is one of the most valuable metals found in waste printed circuit boards (PCBs). In order to recover the metals from the e-waste, PCB recycling process exploiting physical concentration techniques have widely been applied. Size reduction steps including crushing and grinding are done for liberation of Cu from the non-metallic materials such as glass fiber and epoxy resin. Degree of liberation is an important factor by which liberation performance of comminution process is evaluated. 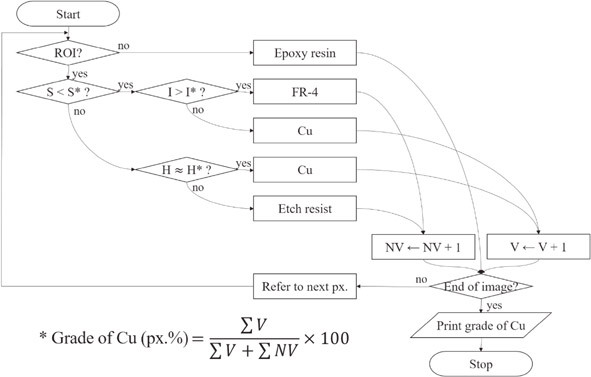 The primary purpose of this study was to investigate liberation characteristics of Cu particles in comminuted PCB by using image analysis method. The analysis procedures include image processing such as noise reduction, edge detection and component discrimination so that a set of images of ground PCB particles provides quantitative information such as Cu grade distribution and degree of Cu liberation. The Cu liberation phenomenon was also discussed in terms of its disassociation behavior from non-metallic material and grindability difference.